2) Make sure you are running Canon firmware 1.1.1. Discussion thread for the 60D. I don't own this camera, so if there is anything you feel is important for this camera and should be in this opening post, please let me know. Right, So far so good, but I'm kinda stuck on the Firmware Update instruction. How does one do this? I can find nothing in any of the software or on the camera and my users manual has long since bitten the dust (drowned, actually, but that's a whole other story). There's no need to be so snarky. Some of us just aren't part of the IT generation. But thanks anyway. Now I just have to work out how to make the ML stuff work. Which would be easier if I could get all the files to unzip. But they won't. I've run into this before on the Mac but what worked for that item doesn't work here. I knew this would be too good to be true. You're not trying to extract the autoexec.bin file are you (OSX may think this is some sort of compressed file based on the file extension, but it is not, it is the ML binary code that is loaded by the camera)? Only extract the actual zip file you download (which extracts just fine on my Mac), and copy those files to an SD card as is (preserving the exact folder structure). I've found that sometimes when I download an ml build it only downloads partially (probably just a slow connection on my end), so the zip file looks like it's there but it won't open. So then I download it again. I've downloaded it three times, same result. Tried extracting just the downloaded file, installed as directed, nothing happens. 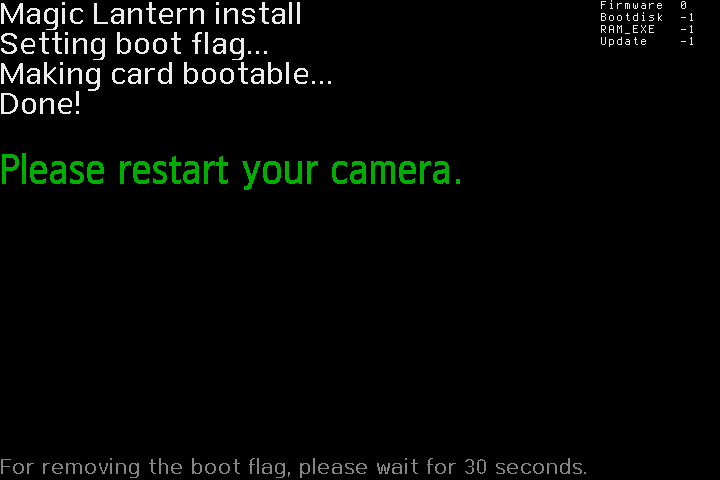 It goes onto the card, along with the firmware update, but when I turn the camera back on, there's no change. I must be doing something wrong, but I don't know enough about what's supposed to be happening to spot what it is. Pity, ML has some very useful functions. Have you tried to press trashcan button some seconds after camera starts up? Snarky? Your first post here is: "I don't know how to find the firmware/manual for a Canon 60D." Every hear of Canon USA? You know, where you can download the firmware and manual super easy for FREE even? Not part of the IT generation or just lazy? Ever think ML just isn't for you? You can BRICK your camera, you know? When you care more about capturing DATA, as opposed to WONDERMENT, you've lost your creative SOUL. Is there any chance to add AF Microadjustment to 60D, if it is even possible? First post of this thread and RTFM. Downgrade firmware = Upgrade. And you are wrong about the version. I hate to sound like a newbie and that's probably because I am. I want to install ML on my 60D but can't find the download on the download page. I find only nightly builds. Is that suitable for someone who had nothing related to ML on his camera. They sound like updates to me and I have nothing to update. If I download and install the latest nightly build is that the same as downloading and installing a stable build? Have been shooting raw video on the 50D for a while and decided to finally do the same on my 60D. I thought I had set everything up the way I usually do with the ML menus (I went through them both together with both cameras, just to be sure), but with the 60D it doesn't seem the same. I don't get the usual framing for 2.39:1 aspect ratio that I have chosen (it seems more like 16:9), and I can't see the live RAW histogram to judge exposure though I have set it on in the menus. Took three downloads and umpty-dozen attempts at the update process but it's finally in. Now I just have to work out how to use the functions I want - but there is a User Guide so a little patience and a lot of studying and experimentation . . .
Just to thanks the whole dev team to provide a tool like ML. I'm an open source enthusiast (using and working with GNU/Linux & Unix systems for many years) and I just discovered the project, replace my old Nikon D3100 with a 60D. Fabulous. Hey thanks, that would help me. I want to shoot continuous 1080p Raw with my 60d running magic lantern. Currently, it stops recording in about 10 secs max. is there any way out? Is it possible by capturing it in the laptop through an HDMI cable, using the laptop as an external recorder? is there ANY way out? I think the only way that could happen is if you use a low frame rate. 24 fps? If not then how much? According to my math, about 6 fps. Not really video. 25 fps = 270 frames (for 10 seconds). 20 fps = 327 frames (for 13 seconds). 16 fps = 440 frames (for 17 seconds). I didn't think there was much point in going lower than 16 fps.